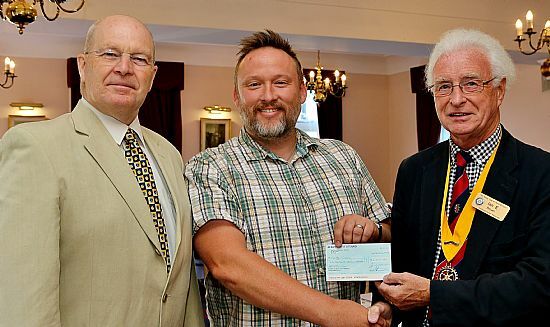 Gareth Ruddock, manager of Checkin/Giraffe, pictured receiving a donation from Vice President Ian E Brown and Rotarian Bob Thomson, returned to the Club to explain the developments of the new South Street Café. The donation has enabled the charity to purchase an Induction Hob and an electronic point-of-sale app that has been designed specifically for the hospitality industry. It’s a fully-functioning till system for the café and will prepare the trainees well for future employment – the very nature of using tablet computers and digital technology makes it easier for the trainees on the Autistic Spectrum, for example. The charity is designed to support people with severe barriers to experience a variety of outlets for work. The South Street Café is just one such outlet and the refurbishment, costing over £30,000 will now include a more even floor, safe stairways and wheelchair access. Gareth further explained the extension of support for their workers to help make the transition to work more meaningful. The support extends to interview techniques and encouragement in employment to allow people to achieve a more permanent place in society.